Although the CDISC ODM Standard is THE standard for the exchange of clinical data and metadata, we observe that "flat" data files, such as CSV files, bar-delimited data files and exports from Excel worksheets are still used in our industry. An example is where laboratories send the data as simple text files with field delimited by a comma or semicolon, or a vertical bar. As there is a high variability in such data files, each type requires different software and methods to work with it. As such, we have decided to not support all possible variations of such "flat" files in our popular SDTM-ETL software, but instead provide a tool that allows users to transform such "flat" data files into CDISC ODM. Our "ODM Generator" allows to load "flat" data files, where data fields are separated by a delimiter. and saved to file for later reuse. 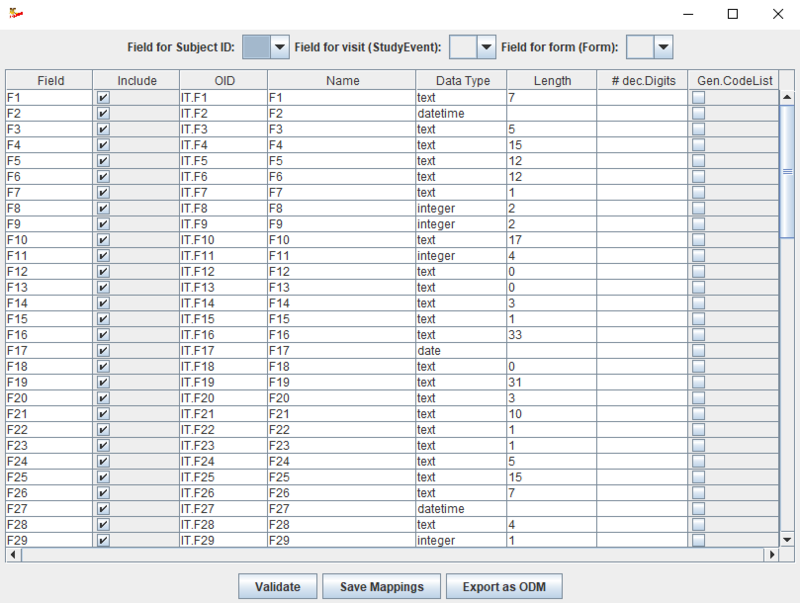 Fields can be assigned an ODM-OID, an ODM name, and the data type and maximal field length can be changed. This needs to be done only once for each distinct file type (e.g. company-internal standard), and can then be reused many times to generate the ODM files with captured data. Fields can also be selected or filtered out to appear in the final ODM. New in version 2 is that fields for which the data is "coded", an ODM codelist can automatically be generated. 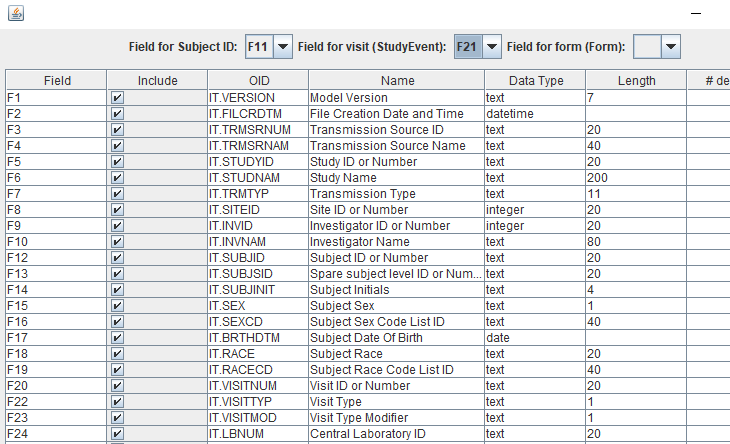 When applicable, fields can be assigned that represent the subject ID, the visit (ODM "StudyEvent") and possibly a target form in the EDC system. The system will then use this information for the organization of the ODM documents. When then clicking the "Export as ODM" button, the loaded "flat" data file will be transformed into a valid and well-organized CDISC ODM file, which can then e.g. be used as input in our SDTM-ETL software. The user can choose between generating "metadata only", "clinical data only" or "metadata + clinical data". The generated ODM metadata can also be further extended (e.g. 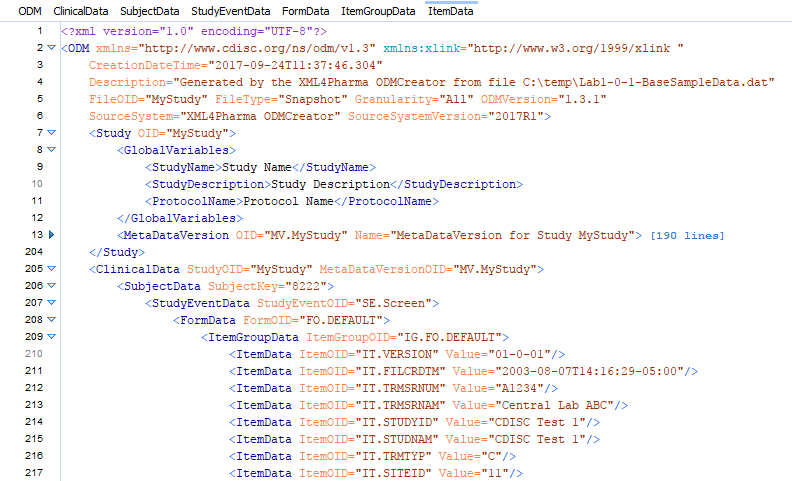 addition of codelists, CRF information, ...) using the "ODM Study Designer" software. When using the graphical user interface, all mappings (between "flat" and ODM) and other settings can be saved to a file. This file can then be reused later if changes need to be applied, or more important, when new clinical data becomes available and needs to be converted too. Such later conversions to clinical data can also be performed in batch mode. 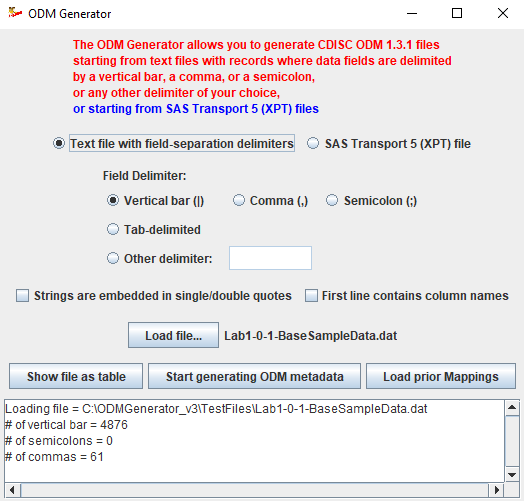 Once a file with mappings using the graphical interface has been saved, it can be used to generate new files with (new) ODM clinical data in batch mode. This e.g. allows to automate the generation of ODM files with new clinical data once new data (in the flat file format) becomes available, e.g. as "cron job", using "job scheduling", or triggered by any event such as the arrival of new data. Very detailed information is available in the User Manual. The ODM Generator software is free of charge when purchasing at least 2 SDTM-ETL licenses, and comes at a reduced price when only 1 SDTM-ETL license is purchased. If you would like to purchase a license for other purposes than in combination with SDTM-ETL, please contact us for a quotation.